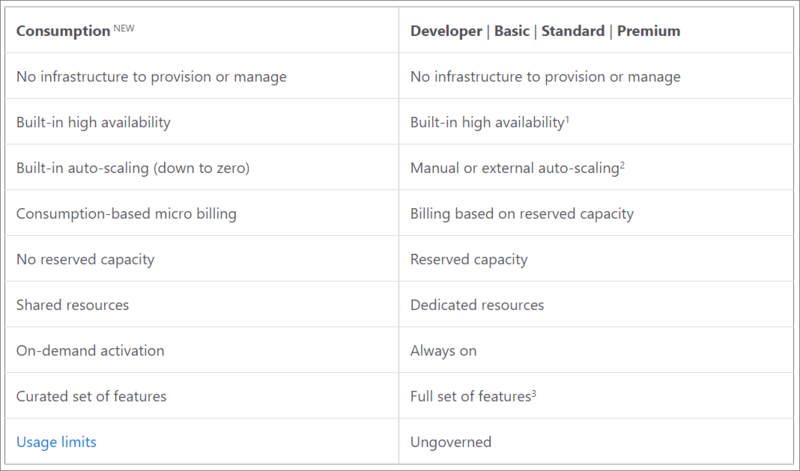 In a recent blog post, Microsoft announced a new Azure API Management Consumption tier. This new usage tier allows for "micro based" billing, and aligns with serverless architecture principles including automated scaling, built-in high availability, per action billing and no infrastructure to provision or manage. The new tier also includes a curated feature set that does not consist of features found in existing tiers, including a developer portal and in-product cache. Azure API Management is a fully managed service that enables customers to publish, secure, transform, maintain, and monitor REST or SOAP APIs. The service is used to create an API façade that acts as a "front door" through which external and internal applications can access data or business logic implemented by custom-built backend services. Azure API Management has traditionally been deployed through a scale unit approach that is metered hourly. This existing model results in billing events being accrued, whether your API gateway is processing requests or not. In this new Consumption tier, the service will be metered based upon usage. Consumption tier uses the same underlying service components as the previous tiers, but employs an entirely different architecture based on shared, dynamically allocated resources. Consequently, it aligns perfectly with serverless computing model, i.e., no infrastructure to manage, no idle capacity, high-availability, automatic scaling, and usage-based pricing, all of which make it an especially good choice for solutions that involve exposing serverless resources as APIs. However, there are some tradeoffs with the new consumption-based tier, including a curated feature set that does not provide a developer portal and usage limits. The following table provides a feature by feature comparison between the new Consumption tier and the traditional Developer/Basic/Standard/Premium tiers. The key benefits of BYOC include full control over cache configuration, the ability to preload and purge cache content, and ability to scale cache size independently from the API Management service instance that uses it. Now it's possible, for example, to create keys granting access to an API (or all APIs within an API Management instance), without needing to create a product and add the API (or all APIs) to it first! Moreover, each API Management instance, now comes with an immutable, all-APIs subscription, which makes it even more straightforward to test and debug APIs within the Test console. The Azure API Management Consumption tier is currently in preview in North Central US, West US, West Europe, North Europe, Southeast Asia, and Australia East regions. There are currently no charges associated with this tier until January 31, 2019. After that, public preview pricing will take effect. For more information regarding costs, please visit the Azure pricing page.